4. März Die vollständige Lösung zu Tomb Raider mit allen Fundorten für Geheime Gräber, Tomb Raider - Basis Außenbereich, Schrei um Hilfe. Nov. Syrien. Das Grab des Propheten. Ist diese Mission beendet, dann stellt sich heraus, dass Laras Auftrag eigentlich schon einige Wochen vorher. Febr. Komplettlösung Tomb Raider: Prolog, Willenskraft, Überleben, Lebenszeichen, Lebenszeichen - Teil 2. Fight through the Trinity base. Survive the freezing waters. Reach the copper mill Climb the copper mill to reach the mine Regroup with Jacob. Find a way through the mountain Break through the door. Explore the valley Light the Signal Fire on the Spire Join Jacob at the upper village Help defend the village against the attack Follow the path up to the tower. Find a way into the Acropolis Enter the Acropolis. Infiltrate the ruins and find Sofia Find the ammunition cache Find a way to destroy the blockade Destroy the blockade to free the Remnants Breach the gate to the Tower Courtyard Attack Trinity to lure the helicopter out. Back to the Forest. Find a safe path back to the Remnant village. Sneak or fight through the occupied village Scale the Cathedral to find the entrance. Find a way inside the cathedral Find an entrance into the archives. Find a way down into the archives. Find a way out of the archives with the Atlas. Find a way to escape with the Atlas. Escape to safety Return to the valley. Find your way to the Observatory. Follow the Trinity helicopter to the Soviet base. Enter the prison block Fight Trinity back. Path of the Deathless. Open the entrance to Kitezh. Find a way into the heart of Kitezh. Into the Hidden City. Cross the walls into the inner city. Find a way into the lost city of Kitezh. Get through the first gate Get through the second gate. Find a way to destroy the gate Go to the other trebuchet Destroy the gate and repel the attack Cross the bridge. You Shall Not Pass. Defeat the Deathless warriors Climb the tower. Reach the top of the tower. Map Relics and documents Murals and chests Challenges. Map Documents Survival Caches Relics, murals and chests. Map Survival Caches, murals and books. Map Relics and Documents Challenges. How to unlock skills Brawler - melee and healing skills Hunter - hunting and scavenging skills Survivalist - crafting and exploration skills How to obtain the lockpick? Cross the stream for another crate with Salvage and then continue up the stone steps to the north. Collect the Endurance Crew - Sam: Make sure to light your torch via the fire on the other side of the statue and then burn down the Salvage before dropping into the courtyard below for more Salvage. Drop off the rocks on the left side and follow the path up to find some Salvage in the bushes and even more Salvage as you turn the corner around the rocks to the right. You can now head to the camp to use your skill points before heading to the gate to catch up with Whitman. Using the Gate day camp, upgrade the Pry Axe with Strengthen and open the large metal container at the camp for 50 Salvage. Before you return to Whitman head south through the arches, across the bridge, and straight to the Salvage beneath the tree bridge you crossed earlier. You can now return to the Base Camp to find another metal case with 50 Salvage at the top of the stairs before returning to Whitman to open the gate. Thanks to some stupidity on the part of the natives, Lara is free to wander around while bound. Quickly hide behind the wall straight ahead, then head up the path after the man walks by. Hide behind the wall to the left and wait for the nearest guard to move away and then ignore the men to the right and head straight for the building marked with white boards. Exit the other side of the building and wait for the guard to pass by and head upstairs. Near the top, wait for the guards to move left, then run into the hiding spot across the road. With the Semi-Auto Pistol in hand, follow the path until you trigger a scene. Once both enemies are dead, loot the bodies and pry the nearby door open. Make sure to grab the Food Cache before taking cover behind the wagon and then guard out will a well placed arrow to the head. Scramble up the wall and jump to the beams, shimmying around and climbing up to take cover behind the crates. Let the guards talk for a while and then headshot the nearest enemy with an arrow, quickly targeting the other and then shooting a third that comes crawling down a ladder. Make sure to grab the Food Cache near the ladder and then climb up while you speak to Roth. At the top, grab the Salvage straight ahead and then jump into the nearby river to move through the crack behind the waterfall to find the Mountain Temple Treasure Map , as well as some salvage that needs some new gear. Enter the cave near the waterfall for Salvage and the Diaries of a Madman: Stranded document and then across the bridge and head up the steps to find two more enemies. You can choose how to take them out, but a useful strategy is to distract one by firing an arrow nearby and then shooting the other in the head before quickly taking out the other guard. Pyromaniac , and move over a tree bridge. Scramble up the wall to reach the upper floor of the building for some Salvage and then head east, across the stairs, to find a Plant in the grass. You can now climb over the ledge, marked in white, for a Food Cache and the GPS Cache 2 on the landing behind the building. You can repeat this on the next enemy, but be careful of the man carrying a flashlight on the bridge above. 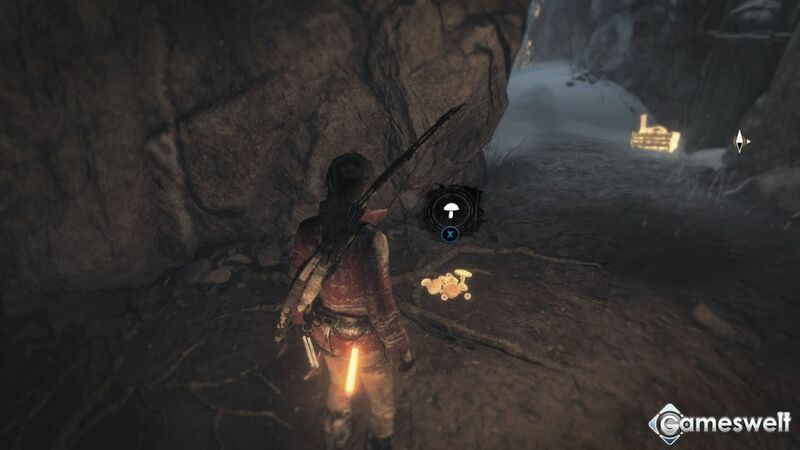 We suggest that you at least locate this lantern in case you need to shoot it in a hurry, since it is missable, but try and take out more of the enemies through stealthy means before you shoot it. Once you have defeated the majority of the enemies, shoot the lantern to ignite the building on fire and draw out any remaining enemies. After leaping over the gap, take the zipline to escape. Grab the Confessions of a Solarii: Salvation immediately right of you as you drop from the zipline and then check the water for a Food Cache. Wade through the water and exit out the other side to find a Plant nearby and then return to where you dropped off the zipline. Light your torch and scramble up the wooden wall to find some Salvage and enter the second floor of the building for the Green Folded Fan. Return to the previous ledge and follow it around for a Plant and then then jump to the roof of the nearby building, which you can enter to find the Gunbai War Fan on the second floor. You can now return to the zipline and head through the arch to reach a thin crevice that leads to Roth. With Roth and Lara now reunited, Lara will gain access to the Village Plateau Base Camp and have to track down the wolves to retrieve the transmitter to radio for help. The village is an expansive area with lots to discover and collect, but much of the area is currently inaccessible at this time. Jump into the water and search the base of the large waterfall for the GPS Cache 1 and then return to land. Illumination and then check the courtyard for a crate of Salvage before entering the nearest building to find netting with additional Salvage. Return to the statue and wall scramble the building to the south to reach the roof for the GPS Cache 2. Jump to the roof above the statue and then across the hanging crate to reach the lower floor of the large building. Grab the Salvage and Silver Flask on the first floor and then take the stairs up and check near the barricaded door for the Ancient Scrolls - Ambassador: There is some Salvage in the next room and a netting of Salvage upstairs, which may require you to backtrack a bit to light your torch. Exit onto the balcony of the building, toward the camp, and climb onto the roof to your right. Hop to solid ground next to the roof to find the GPS Cache 3 and then drop to the ground on the unexplored side of the building. The GPS Cache 4 is next to the tombstones, near the stone lantern. Climb up the front of the crashed plane and run through the body to reach an island via the plane wing to find some Salvage near the tree trunk with rope around it. Head back up the wing and find a well-hidden Salvage on a small ridge next to the stairs leading up to the tree that got hit by lightning. You can now climb up to cross the body of the plane and jump to the opposite side, climbing up to reach the area near the wolves den. Instead of entering the den, turn right and cross the bridge to find the GPS Cache 5 near the entrance to the cave at the base of the waterfall. As Lara exits the cave the large wolf will attack, triggering another QTE: You can now exit the cave and walk right toward the fence, looking down at the wooden rooftop with the flashing GPS Cache 6. Survival Instincts will now point out rocky walls that can be climbed with the Climbing Axe, so test it out on the cliff wall directly across from the camp. Follow the linear path to reach a day camp and pass the waterfall to reach the actual puzzle room. Hop across the platform with the hanging corpses and quickly jump across again to light your torch. Head back outside and climb the rock wall next to the wolf den, then leap towards the rock wall in between the two waterfalls and climb to the top. Hide behind the crates and wait for the men to finish their conversation to take out out each of the guards silently with headshots and move towards the building of the two guards and turn around to kill the third one in the building across the river. Discoveries document, while the opposite side has the GPS Cache 7. Climb to the balcony of the upper level to find a Food Cache and then scramble up again to find the Yagen relic. You can head back down to get the Salvage hanging from the netting you skipped a bit ago, but return to the stone lantern and jump to the roof of the nearby building for the GPS Cache 8. With all of the items cleared from the area, return to the stone lantern and jump to the rock wall to climb up and reach a bridge. Climb up and listen to the communication with the other survivors and then slide down the zipline into the new area with some enemies that will automatically be aggressive. Focus on taking out the man who throws molotov cocktails at you and then finish off the one with a bow, before a third comes at you when you move forward. You can now light your torch to grab the Salvage in the net and then squeeze through the cavern to reach the Broken Tunnel Base Camp for a scene. There is a Bronze Chinese Coin next to the tree in the base camp and a GPS Cache 1 hiding in the bushes on the right side of the disabled truck nearby. Once clear, continue forward while checking the left side of the path for a Plant and take cover behind another old truck. There are a large number of enemies ahead and a man attending a searchlight, who also mans a turret if you are discovered. Start by shooting the man on the spotlight and then take out the nearby guard, slowing moving forward and killing more guards further up the road. Slowly sneak up to the welder and break his next and then head upstairs for a Bronze Japanese Coin behind the staircase entrance. Wait for the pacing guard to move away, or distract him, and then kill the stationary guard. You can now cross to the tower to find a Food Cache and the GPS Cache 2 around the corner before you climb to the top and zipline to a new area. Wade through the water and exit to find the Confessions of a Solarii: The Best Job document on the desk and then continue down the hall to the greenish gas. The gas is poisonous and will kill Lara is she breaths it in too long, so use the the Pry Axe to turn the valve and shut it off before you head through the area. Collect the Salvage in the next room and then carefully turn the corner to spot two men discussing fuel. If you wait until both men are next to the barrel you can shoot it with and arrow to make it explode, leaving only a third guard to deal with. The room across from the one you exited has a Food Cache next to the burning barrel and in the adjacent room you can crack open a locker for Salvage. Draw your bow as you continue up the stairs to kill the Solarii that jumps down from the ceiling and then head through the small gap the man exited to reach a generator room. Climb the green machine and hop through the vent opening to reach a control room and then turn the valve. To the left of the destroyed control room is a door that has been blown open that leads back to the beginning area. Backtrack to the fire barrel to light your torch and return to the generator room. You can choose to kill the Solarii, then enter the next room to find the Wartime Intelligence - Scientist: Equip your assault rifle and prepare for an onslaught as Lara enters the next room into an ambush. Quickly dispatch one or two enemies rushing you and then focus on the Solarii on the upper level. After killing the remaining enemies more will enter from the left, including some with molotov cocktails. Use the ramp nearby to reach the upper walkway and follow it to the Map Room Base Camp. Back downstairs, take the hallway with the light above the door and kill the Solarii that drops down. Log In Sign Up. Keep me logged in on this device Forgot your username or password? Sign up for free! What do you need help on? Would you recommend this Guide? Page 1 of 4 Next Page Last Page. Keep me logged in on this device.